Isn’t it a blissful feeling to quench your thirst with a glass of chilled water on a hot afternoon? It is, right? Thanks to the majestic refrigerators modestly standing in the corner of our kitchen. Over the past few years, refrigerators have drastically improved the art of food preservation. Refrigerators have become an integral element of modern households. Life without this versatile appliance would indeed be spine-chilling. There have been many food preservation techniques employed over the past, but refrigeration has emerged to be the most effective one. We extract countless benefits from refrigerators and freezers. Preserving excess food, keeping fruits and vegetables fresh and keeping our favourite beverages chilled are to name a few. 1 Why do you need a Refrigerator? Why do you need a Refrigerator? Although refrigerators and freezers are essential for every household, they are a boon for foodies and fitness enthusiasts. People fond of eating, rush to their refrigerators after the slightest indications of hunger. Also, how can we not mention late night ice cream cravings! Phew, what a beauty! Coming to fitness professionals, refrigerators assist them to keep their meals edible for long. Preparing batches of meals in advance for the whole week is a common practice among fitness enthusiasts. Meals scheduled to be consumed in a day or two are advised to be refrigerated. While, meals to be consumed further ahead in the week must be frozen. It is needless to say that people with certain fitness or health goals in general, must own an appropriately sized refrigerator. However, we do not convey that children and senior citizens should deprive themselves of this facility. Refrigerators are indeed an appliance for one and all! But, before investing your hard-earned money in to buying a refrigerator, you must know about all of the available variants and their provisions. A little research before the actual investment always eliminates any potential remorse. There are a variety of refrigerators accessible in the Indian market with discrete specifications. To know the appropriate brands, size and features desirable for you and your family, read along. We have it all covered in the subsequent sections. Domestic refrigerators in The Indian subcontinent are broadly classified into the following two categories: ‘Direct cool’ type refrigerators and ‘frost-free’ type refrigerators. Click here to check out a point to point comparison between these two types. Direct cool type refrigerators induce the cooling effect by convection. Which means there are surfaces inside of the insulated cavity of the refrigerator that are initially cooled resulting in cooling of other elements via convection. Subsequently, when water vapour comes in contact to the cooled surface, it freezes resulting in frost formation. These types of refrigerators require manual defrosting of the interiors. All direct cool refrigerators come in a single door model and are highly energy efficient. 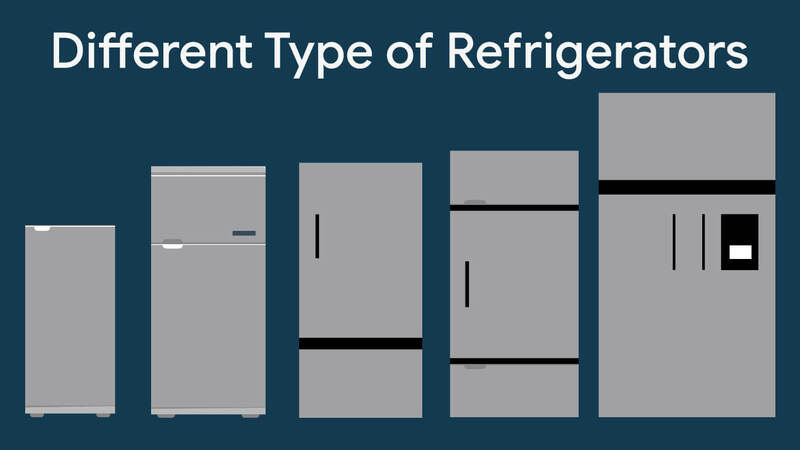 This article discusses some commonly occurring refrigerator problems and their fixes including a proper method for manual defrosting. Frost-free type refrigerators on the other hand are the preferred type at present. Frost-free refrigerators produce the cooling effect with the help of electric fans. Use of such cooling technique ensures controlled cooling and negligible deposition of ice in and around the freezer. These are also equipped with auto-defrost technology to enable the user automatically clear out any deposit of ice in the freezer. Frost-free type refrigerators are more reliable as they produce controlled and sustained cooling in all compartments. These are further divided in to four types based on the door provisions and freezer locations. As the name indicates, these refrigerators have a large single door for the entire appliance. The interior compartment has a freezer at the top and a vegetable container at the bottom. The space left out between the two can be utilized for general refrigeration purposes. Single door refrigerators have their own pros and cons. The obvious advantage of getting a single door refrigerator is that it is relatively inexpensive. Also, they occupy less floor space owing to their small size. Single door refrigerators generally range between 50-300 litres in capacity. These are ideal for small offices, dispensaries and households with a few members. Double door refrigerators are the most popular model all over the country. These are comparatively larger in size and have two distinct doors for two separate compartments. Generally, the smaller upper door confines the freezer chamber (top mount type). The other door seals the fridge compartment that maintains a temperature slightly higher than the freezer. Double door refrigerators come with a storage capacity of 240-500 litres. The provision of two separate doors ensures efficient usage of the appliance. Frequent opening of the fridge door does not interfere with cool ambience of the freezer. Such refrigerators will evidently have larger freezer compartments and spacious shelves in the fridge section. Double door refrigerators are ideal for families with 4-5 members. Triple door refrigerators are a unique variant of frost-free type refrigerators. These possess three distinct doors for three separate compartments. Conventionally, the upper chamber is the freezer, the general refrigeration unit in the middle and the vegetable bin in the bottom. This model is a user-friendly design as it allows the user to only open the needed compartment without interfering with the other two. This design also confines the odour of separate sections to themselves and hence prevents potential altering of tastes of different eatables. Moreover, this design saves you power as you only open a single compartment at a time. This leads to prevention of interaction of outside air with the interior cooling cavities. The storage capacity of these models ranges from 240 to 350 litres. Side by side door refrigerators have two narrow doors confining two separate compartments. Usually, the left compartment is the freezer section and the right one is the fridge. The design is analogous to that of a cupboard. Such an organization of the cooling chambers makes for a spacious interior cavity. Some models are also equipped with through-the-door water dispensers. This provision allows the users to fill any water vessel without even opening the refrigerator. Side by side door refrigerators come with large storage capacities ranging from 550 to an enormous 900 litres. Just like other designs with separated cooling chambers, the side by side door too helps you save up on energy consumption. Such refrigerators are suitable for large joint families with high storage requirements. Bottom mounted refrigerators are essentially double door refrigerators with freezers located in the bottom. This implies that the general refrigeration compartment lies at the top. The fact that people generally use the refrigeration compartment more frequently as compared to the freezer makes it a user-friendly design. Such a design eliminates the discomfort of bending over repeatedly to take out fruits and vegetables which would have been the case otherwise. The capacities of bottom mounted refrigerators are similar to above-discussed double door refrigerators. This design can be of great convenience to people who rarely freeze stuff and hate to dig deep down to get a serving of veggies. 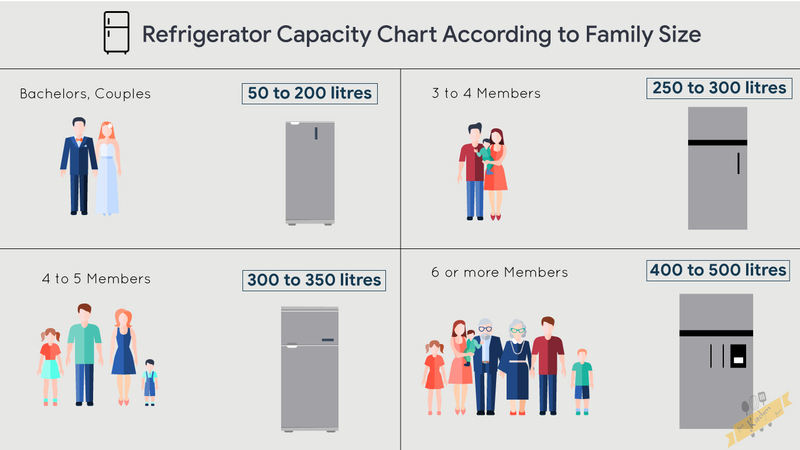 Family size is one of the most influential factors while choosing the correct capacity for your new refrigerator. Other minor factors may be space restrictions, storage requirements and of course, your budget. A storage capacity of 200 litres is ideal for bachelors or couples. A family of 3-4 individuals would ideally require a storage capacity of 250-300 litres. A family of 4-5 individuals would need a storage capacity of 300-350 litres. A storage capacity of 400-500 litres is sufficient for large families with more than 6 members. Once you have figured out the capacity and the type of refrigerator you want, it might feel like you’re ready to take the leap. But you have to hold your horses, there is still some more research needed in order to select the best refrigerator in all aspects. We have it all listed further along the article. keep reading and help yourself pick the ultimate refrigerator that will suffice your needs while staying economical in the long run. The performance of any refrigerator can be judged on the basis of its ‘star rating’. The star rating is basically a score assigned to any electrical appliance on the basis of its energy consumption. 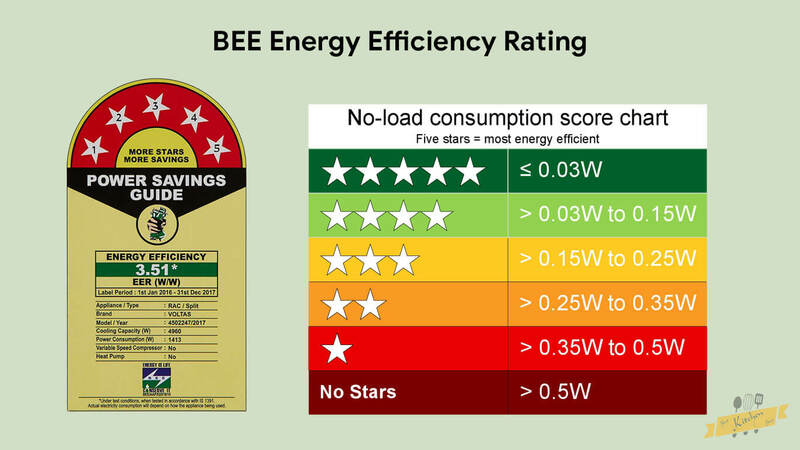 The bureau of energy efficiency (BEE) rates refrigerators on a scale of 5 stars. 1 star being least energy efficient and 5 stars being the most energy efficient appliance. In simpler terms, the higher the star rating of a refrigerator, the lesser is the electricity consumption. Or, you can go by the slogan of “more stars, more savings”. So, investing in a best refrigerator with a decent energy efficiency rating will prove to be an economical deal in the long run. Although it is advisable to invest in a 5-star rated refrigerator, it can significantly increase your initial cost. Inexpensive models have low energy efficiency ratings and models with 5-star ratings cost you a fortune. This situation usually creates a dilemma for customers. The best solution out of this problem is to pick a refrigerator that fully satisfies all your needs and has an energy efficiency rating of 3 to 4 stars. This way, you don’t have to burn a hole in your pocket and you also pay reasonable electricity expenses. Besides the energy efficiency star rating, selecting a refrigerator with inverter compressor technology can significantly reduce electricity consumption. An inverter compressor can be comprehensively described as a system that helps the appliance to use electricity in proportion to cooling requirements. Compressors in regular refrigerators tend to function at their peak capacities at all times. Essentially, summers exert a higher cooling stimulus as compared to winters. So, it is unnecessary for the refrigerator compressor to work at peak capacity when cooling requirements are less i.e. winters. Recent refrigerator models in India, from reputed brands have started to inculcate smart inverter compressors. This addition enables the refrigerators to smartly utilize energy in proportion to cooling requisites. To briefly describe, invertor compressors work optimally when the required cooling is more and switch to subtle execution when the desired cooling is met. This feature evidently helps users to save up on electricity bills. 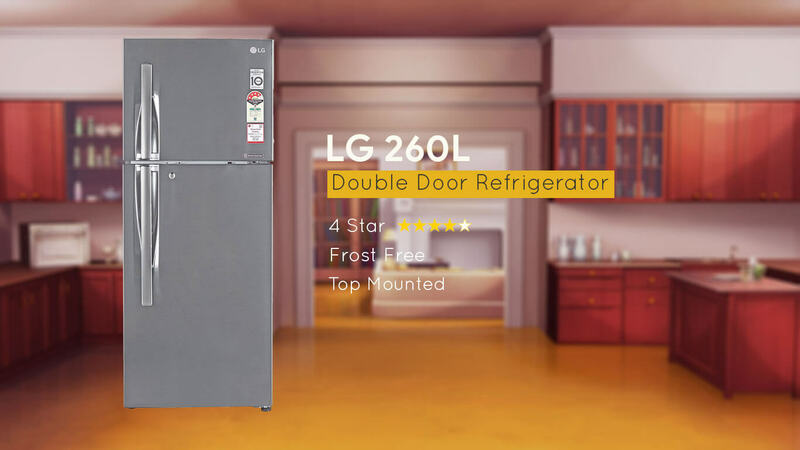 Now that you have successfully deciphered the type, size and desirable features in your refrigerator, you can browse through the models that fit in your segment of requirements. However, choosing the best out of all available options can be a tricky job. 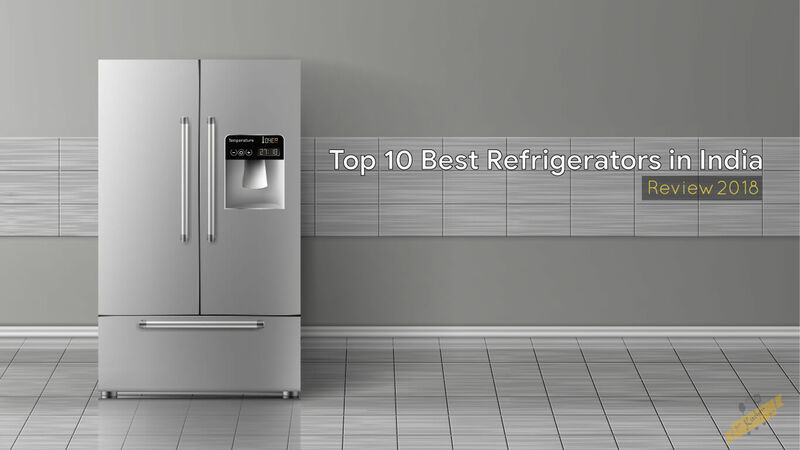 Fret not, we have compiled a list of the best refrigerators in India in each segment. You’ll find below the best models in every category of refrigerators. Just keep your requirements in mind and pick the one that suits your family the best. Rest assured about their performance for they have been thoroughly examined on the basis of cost-effectiveness, energy efficiency, durability and customer feedback. Samsung needs no introduction in the electrical appliances industry. They have their influence in the consumer products industry like no other brand and for valid reasons. Moreover, public trust has cemented their spot as one of the top electronic appliance brands in India. 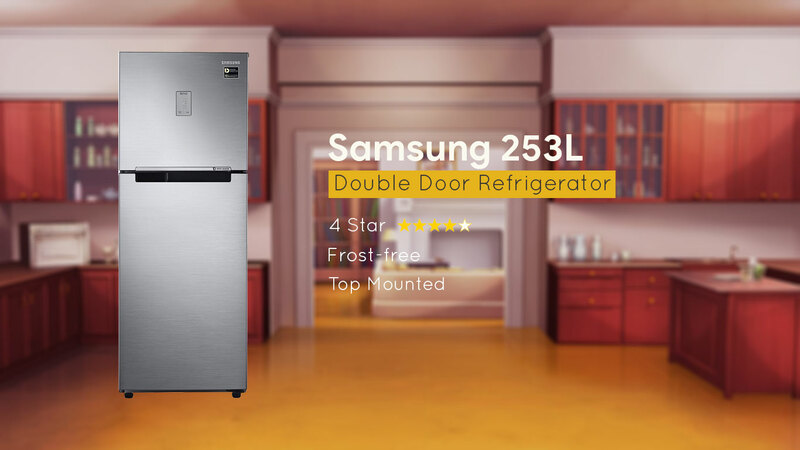 The Samsung 253L 4-star refrigerator is a double door type refrigerator with a storage capacity of 253 litres. This capacity is ideal for moderate sized Indian families with 3 to 4 members. Provision of separate doors for both compartments leads to optimal consumption of electricity. Along with being reasonably priced, this refrigerator from Samsung also has an energy rating of 4-stars. This implies that you not only buy it at a relatively low cost but also save your electricity expenses in the long run. This is indeed the best deal you could find in the current market. Let’s quickly go through the features of this refrigerator. The shelves in the fridge compartment are strong and durable as they are made from toughened glass. Typical Indian families can conveniently store heavy utensils without even remotely damaging the shelves. To give you a fair idea of the toughness, the tempered glass used in making the shelves can safely withstand up to 150 kilograms of weight. Along with being rated a 4-star on the energy efficiency scale, this model is equipped with an inverter compressor. This indicates that the compressor works at full capacity when higher cooling is required and smartly attains a lower stable performance level once the cooling is met. you are ensured to save up more on energy consumption. We do not exaggerate when we say this refrigerator is packed with worthy features. Cooling is attained 31% faster than other competent models and consequently edibles remain fresh for long. Also, you have your favourite beverages chilled quickly. The door alarm alerts the user if the door has been accidentally open for more than 2 minutes. This prevents loss of cool air and unnecessary electricity consumption. Other salient features include twist ice maker, easy slide shelves, big bottle guards, stabilizer free operation and more! The product has a 1-year manufacturer’s warranty. It is safe to say that this is a very well deserved first spot! 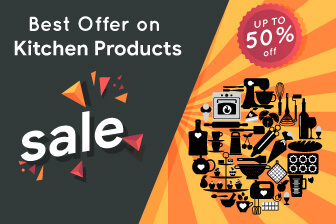 Haier is a leading multi-national consumer electronics and home appliances company. Products from Haier have been consistently bestowing consumers with value for money services. This particular refrigerator from the brand has a capacity of 195 litres which is ideal for a small family of 2 to 3 members. The freezer is situated at the top and has a capacity of 19 litres. The model sits elegantly in kitchens with restricted space. It is an extremely economical pick for people looking for refrigerators under 200 litres of capacity. The refrigerator boasts an energy rating of 4 stars making it an extremely energy efficient model. Coming to the interiors, the shelves are manufactured from toughened glass that can safely withstand a load of up to 120 kilograms. It can be deduced that you can easily store large utensils over the glass shelves. Adding to the features, the refrigerator exhibits stabilizer free operation. This means, the refrigerator works optimally during minor voltage fluctuations. To be precise, the fridge functions at its best in a voltage range of 135-290V and there is no need to install an additional stabilizer. The 1-hour icing technology stands out of the other regular features. It enables the user to make ice cubes within an hour. This implies, it is an absolute delight for ice-cream lovers. On the downside, there is no automatic defrost system. You’ll have to manually clean the ice build-up. Life is indeed good with this smart refrigerator in your kitchen. LG hasn’t held back a bit with the features in this model while keeping it in a reasonably low price range. Appearance wise, the fridge has a decent design that will bestow your kitchen with a high-end look. The refrigerator is a double door type and has a storage capacity of 260 litres. This capacity is sufficient for a moderate sized Indian family with 3-4 adult members. It a top mounted type refrigerator implying that the freezer compartment is concealed by the top door. The bottom door leads to the refrigerator chamber with adjustable glass shelves. The shelves will stay functional for long, as they are made out of toughened glass. With such durable storage platforms, you can conveniently store large volumes of leftover edibles without a thought. BEE has tagged this model with a 4-star rating on the energy efficiency scale. This makes the fridge a highly energy efficient model along with being considerably affordable. It is certainly a smart buy. Cost-effectiveness is the highlight of this pick. The product also features inverter compressor technology. This addition ensures that there is optimal use of electricity and prevents unnecessary energy consumption. Air vents distributed uniformly along the height of the refrigerator enhance even and sustained cooling. Also, your fruits and veggies stay fresh for long owing to the moist control crisper in the bottom. The brand offers a 1-year manufacturer’s warranty on the product and 9-year on the compressor. 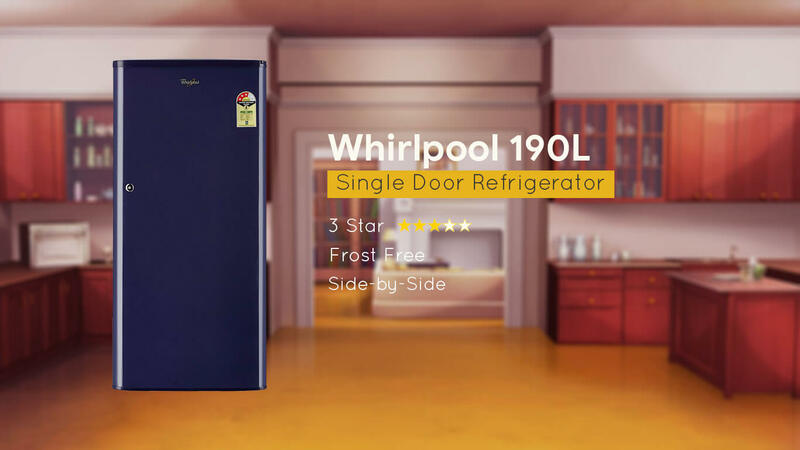 The Whirlpool 190 L 3-star is the best-selling single door model from whirlpool, and for all valid reasons. This is an extremely economical pick for small Indian households. With a capacity of 190 litres, this model is ideal for families with 2 to 3 adult members. Along with being reasonably priced, the fridge boasts a 3-star energy efficiency rating. This implies that not only you expend less initially but also save up on the electricity bills in the long run. It’s a win-win right there. This model displays 9-hour cooling retention even during power cuts. The interior cavity of the fridge is provided with durable wired shelves to conveniently store large utensils. Furthermore, you can easily store big bottles against the bottle guard provided at the inner side of the door. The fridge comes with two ice trays within the freezer. Beneath the freezer, you get a flat chiller that can be specifically used to store cheese slices, milk packets and chocolate bars, etc. The door of the fridge is lined by an anti-bacterial gasket that prevents the build-up of fungi and bacteria. You also need not worry about minor voltage fluctuations causing any harm to the appliance as it optimally functions between a large voltage range. To be precise, the fridge has an inbuilt stabilizer that enables it to function smoothly between 130 to 300V. The appliance is covered by the manufacturer’s warranty of 1-year for the product and 5-year on the compressor. 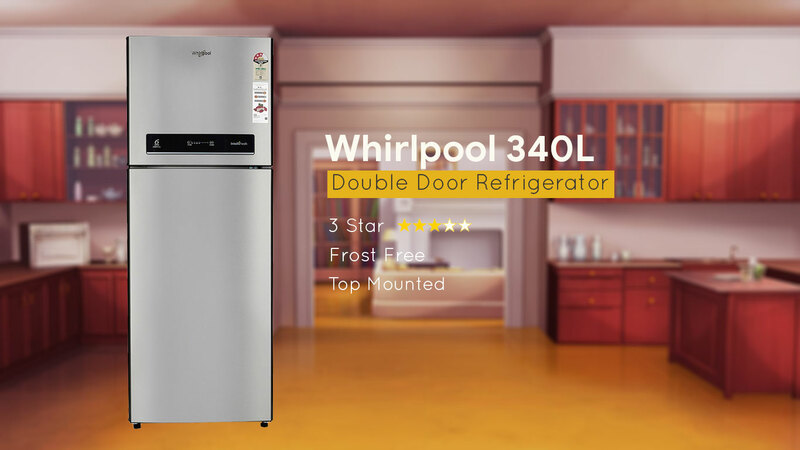 We now have a relatively smaller refrigerator from whirlpool that has set a quality benchmark for similar models from other brands. This model is a perfect match for people looking for a fridge packed with features on a tight budget. 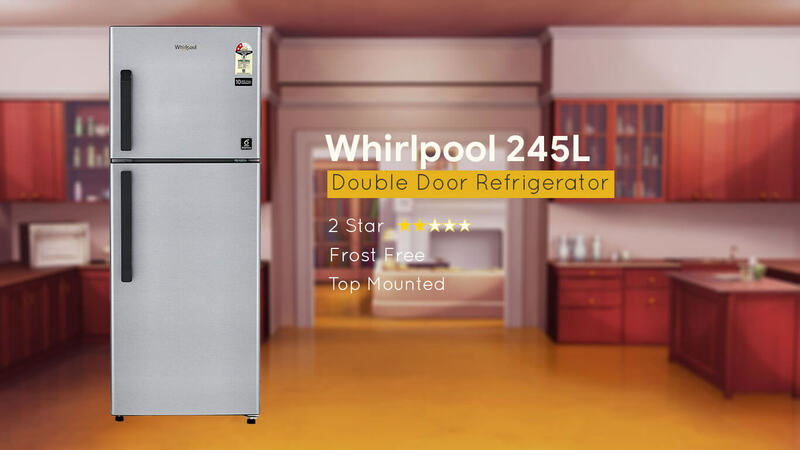 The whirlpool 245 L 2-star model is a double door refrigerator with a storage capacity of 245 litres. This capacity is perfect for a family of 3-4 adult members. The refrigerator is a top mounted type which means the freezer is located at the top and consequently the general refrigerating unit at the bottom. The refrigerator is tagged with a 2-star energy efficiency rating but also has an exceptionally low initial cost. You only get either of the two. This model displays smart features while sitting in an affordable price range. The shelves in the refrigerator compartment are made out of tempered glass and hence will stay persistent even after sustained heavy loading. Similar to the previous mention, this model displays long-lasting freshness of edibles owing to the continuous supply of fresh and cold air through the fresh flow flexi-vents. If your old refrigerator retains stale odour from previously preserved food, its about time for you to exchange it with this versatile model. The ‘active deo’ feature in this model helps you keep the refrigerator compartment free of odour. The fridge also has a large vegetable crisper located in the bottom. The provision of a large bin will be helpful for people that stack their groceries for the week at once. Adding to the benefits, the fridge works optimally between 130 to 300V implying you do not need a stabilizer to overcome voltage fluctuations. Whirlpool is another reputed consumer products giant that has been manufacturing reliable major home appliances for decades. Positive responses from customers on various platforms is indicative of the quality of their products. This particular model is a double door top-mounted refrigerator with a capacity of 340 litres. The capacity is ideal for moderate sized families with 4 to 5 members. As evident, the refrigerator has a separate door for the freezer. This ensures minimal heat exchange upon opening the fridge door. The refrigerator is rated a 3-star on the energy efficiency scale. This implies that the model is moderately energy efficient. However, the exceptional features outweigh this deficiency. The shelves inside the refrigerator cavity are sturdy and are manufactured from toughened glass. Users need not worry about damaging the glass shelves upon storage of large utensils. The sleek design of the refrigerator offers an attractive overall appearance to the kitchen. The model has 3 intellisensors located on the outer panel, in the freezer and in the refrigerator compartment respectively. All 3 sensors mutually interact in order to provide sustained freshness in both cooling units. You need not worry about the freshness of the preserved edibles owing to the air tower vents that let out cool and fresh air in to different sections of the refrigerator. Moreover, the fridge operates optimally within the voltage range of 130 to 300 volts implying there lies no need of installing an inverter. This product comes with a manufacturer’s warranty of 1 year. 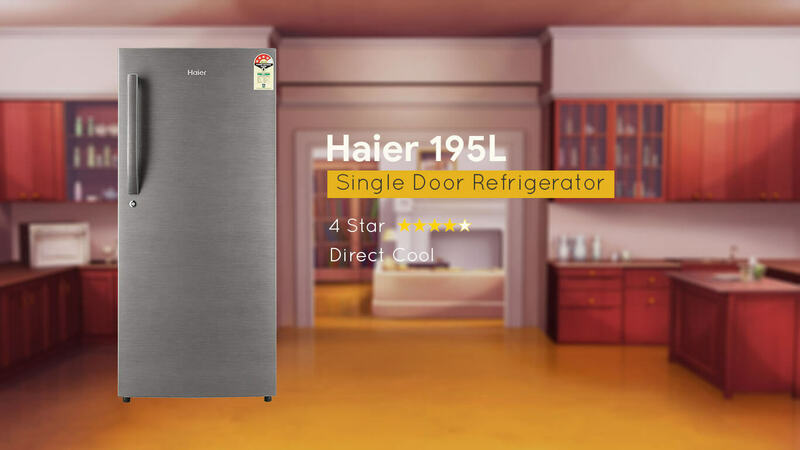 On number 6, we have an extremely resourceful bottom mounted double door refrigerator from Haier. Bottom mounted refrigerators essentially have the freezer located below the fridge compartment. Such a design cuts the discomfort of bending over to reach to the fruit and vegetable basket. This particular model has a storage capacity of 345 litres which is more than sufficient for a family of 4 to 5 adult members. The interior cavity of the fridge is spacious with strong and durable shelves. As desirable, the shelves are manufactured out of tempered glass making them highly resilient to heavy loads. The refrigerator has a 3-star energy efficiency rating. This indicates that you’ll be able to considerably save up on the electricity consumption. Although this model can seem to be a bit expensive at first, it will prove to be an economical buy in the long run. Furthermore, the model is equipped with an inverter compressor. This inclusion ensures prevention of unnecessary wastage of energy. It also leads to silent operation and long compressor life. The vegetable crisper in the fridge is almost twice the regular size. It is a good add-on for people who tend stack their weekly groceries at once. Also, the complete crisper can be utilized to store vegetables alone as you get a separate storage section for fruits. How convenient is that! Some other remarkable features included in this model are twist ice dispensers, 1-hour icing technology, door lock and one touch display to regulate the temperature. Furthermore, the appliance is covered with 1-year manufacturer’s warranty on the product and 10-year on the compressor. We now have a resourceful pick for people looking for large refrigerators with big joint families. 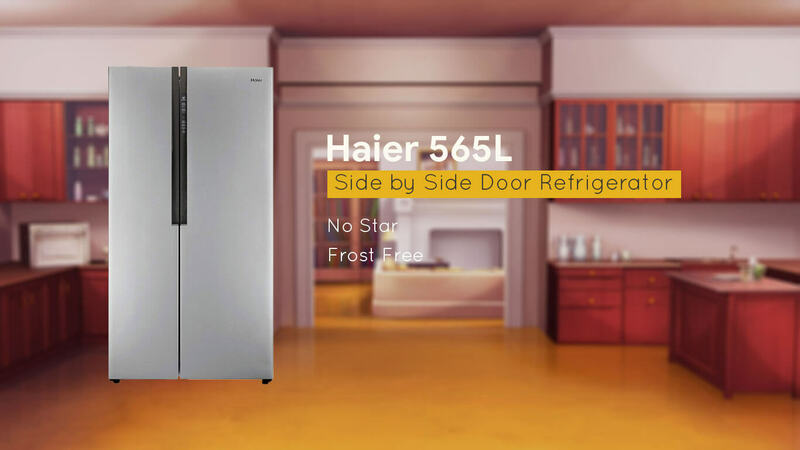 The ‘Haier 618 SS’ is a side-by-side door refrigerator with storage capacity of 565 litres. 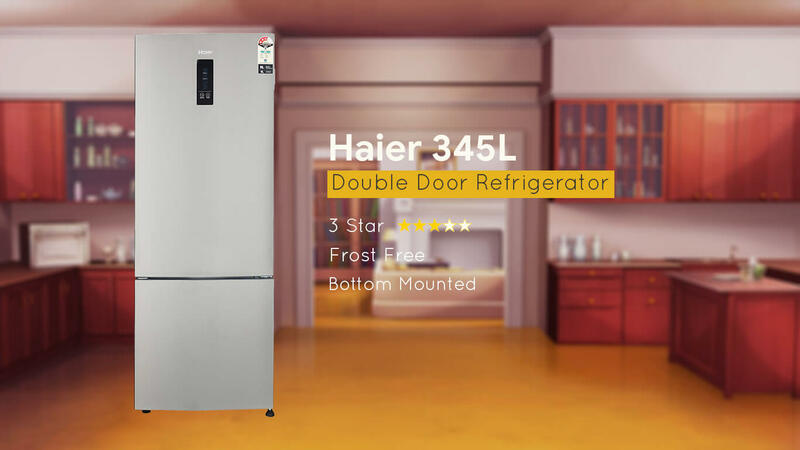 Haier has specifically designed this model to suffice the needs of large families with more than 6 members. The entire left compartment is the freezer and has a gigantic capacity of 218 litres while the right compartment is the refrigerator with a decent capacity of 347 litres. This is indeed a good fridge-freezer ratio. The refrigerator features a reciprocatory compressor implying that there is optimal usage of electricity. To be precise, the model utilizes less than 1unit of electricity per day. Furthermore, the glass shelves in the refrigerator cavity are adjustable and are manufactured out of tempered glass. So, you can rest assured for the durability of the shelves. Controlling the refrigerator temperature has never been easier. you can conveniently set the temperature at the touch of a button. The 90 degree contour door of the model enables the users to easily access the fruit basket even without opening the door wide open. Other noteworthy features of this versatile refrigerator are super cool super freeze, holiday function and digital temperature control. Getting this model from Haier will single-handedly take care of all cooling needs for large families. It is also highly recommended to people owning restaurant businesses. 1-year manufacture’s warranty on product and 10-year on the compressor makes it a smart investment. 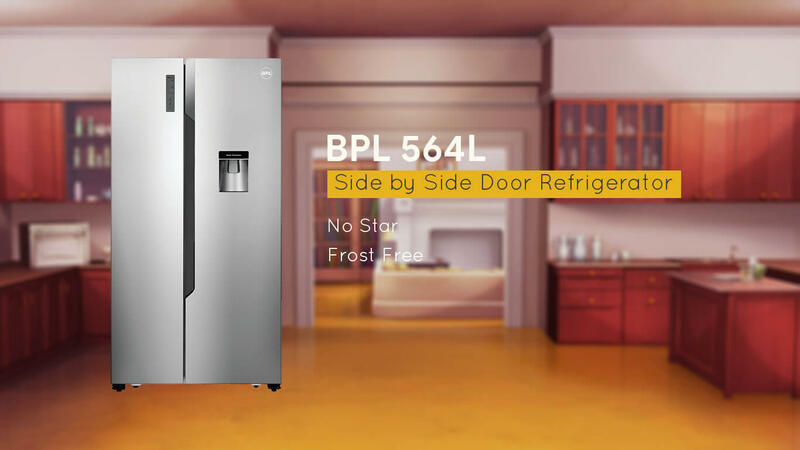 This model from BPL is the perfect match for people looking for side-by-side door refrigerators in an affordable price range. Unlike other models of similar capacity and type, this one is reasonably priced and also has all desirable features. The overall capacity of the refrigerator is 564 litres ideal for large Indian families with more than 6 members. The complete left compartment of the refrigerator is the freezer and has a capacity of 178 litres. You sure won’t run out of freezer space while having this masterpiece by your side. The right compartment is the general refrigerating unit with a capacity of 340 litres. The interior cavities concealed by both the doors are equipped with strong and durable shelves for storage. These are manufactured out of toughened glass. So, you can conveniently store all your leftovers without even remotely damaging the glass shelves. Coming to the remarkable features, it is furnished with a quick freeze feature that enables you to prepare ice almost instantaneously. Regulating the temperature is an easy task with the one-touch LED display. Multi air flow vents provided over each shelve ensure uniform cooling of the complete compartment. To top it off, the refrigerator functions in absolute silence making it a favourable pick for people accustomed to peaceful ambiance. How can we forget the most attractive feature of all? It has a through-the-door water dispenser. This means, you have the privilege to fill up a glass of chilled water without even opening the door. The brand covers any malfunctions with a 1-year comprehensive warranty on the product and 5-year on the compressor. We here have another side-by-side door refrigerator specifically for people with extraordinarily large joint families. 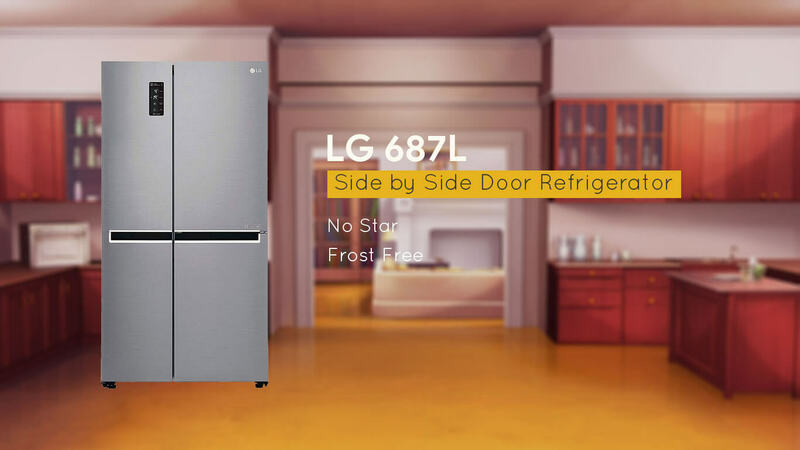 The LG 687 L frost-free model has a gigantic capacity of 687 litres. Such a large capacity is best for families with more than 6 members. This model can also prove to be a smart choice to install at commercial restaurants. The complete left door of the refrigerator confines the freezer. While the adjacent compartment is the fridge. People with less freezing requirements can find the freezer section to be oversized. However, it is appropriately sized for people with corresponding high freezing needs. The model exhibits energy efficient functioning owing to the inverter compressor technology. This inclusion ensures that the prevention of unnecessary wastage of electricity. The compressor functions on its peak capacity when cooling is required and after it is met, it switches to a stable implementation using lesser energy. You have the convenience of spacious interior sections in both the compartments. Moreover, the interiors of the refrigerator and the freezer sections are equipped with strong and adjustable shelves. The material out of which the shelves are manufactured is toughened glass. This means, you need not worry about storing large volumes of leftovers in heavy utensils. The material is formerly tested to safely withstand similar loads. The evenly distributed multi air flow cooling vents enhance uniform and sustained cooling. The express freeze feature helps you to quickly freeze edibles and almost instantly withdraw ice cubes. These smart features along with the generous storage capacity make this model a value-for-money product. There’s also a 1-year comprehensive warranty on the product and 10-year on the compressor covered by the brand. Some high-end side-by-side door refrigerators are equipped with through-the-door water dispensers. This provision allows the users to draw chilled water without opening the doors of the refrigerator. Moreover, it gives the refrigerator a sleek and modern appearance. Nothing would be more disappointing than to have damaged shelves within a short period of making a purchase. Long shelf life can be ensured by analyzing the material out of which they are manufactured. Three most common types of shelves are wired, acrylic and toughened glass. The latter i.e. toughened/tempered glass shelves are generally the most durable type. The quick freeze feature can prove to be beneficial for people that frequently need ice at short notices. Also, it can be helpful at instances when you instantly want to freeze ice-creams or kulfis. Humidity drawers meant for storing fruits and vegetables can be used to our advantage. Smartly setting the humidity control knob for respective compartments will prevent premature rotting. This feature is extremely helpful for people that tend to stack groceries for the entire week at once. Voltage stabilizers work to protect your refrigerators against sudden voltage fluctuations. The most severe cases of voltage fluctuations occur during power cuts. Having a reliable built-in voltage stabilizer can substantially reduce the chances of damage due to voltage fluctuations. A cool pack is a specialized mechanism that helps the users to prevent spoilage of food during power cuts. The cooling gel enables efficient transfer of cool ambiance from the freezer to the refrigerator keeping the refrigerator compartment at relatively temperature for long. It is a common drawback for most of the refrigerators that they produce too much noise while in operation. Good refrigerators do not have the tendency to produce high levels of noise. This can be a decisive factor for people accustomed to serene environments. Consumers have the privilege to choose from a variety of door styles to match their needs. For instance, single door would be suitable for small offices or bachelors. Double and triple door would be ideal for moderate sized families. Similarly, side-by-side door refrigerators can suffice the needs of large families. Refrigerators have evolved from being a luxury to a basic necessity in modern households. The appliance has raised the kitchen convenience level to new heights. However, you get these benefits only if you make the right choice. The retail market is literally flooded with thousands of models with varying features. In such a scenario, it becomes extremely confusing for the consumers to make a choice that is easy on the pocket and serves them for long. Thorough analysis of all competent models, their price ranges and desirable features is the key to selecting the best out of all available options. Take a deep breath, because we have done the work for you! The above compilation has been prepared after rigorous examination of all variants on the basis of cost-effectiveness, attractive features and consumer feedback. We really hope this comprehensive guide helps you in choosing the best refrigerator for your family.